What Is It? 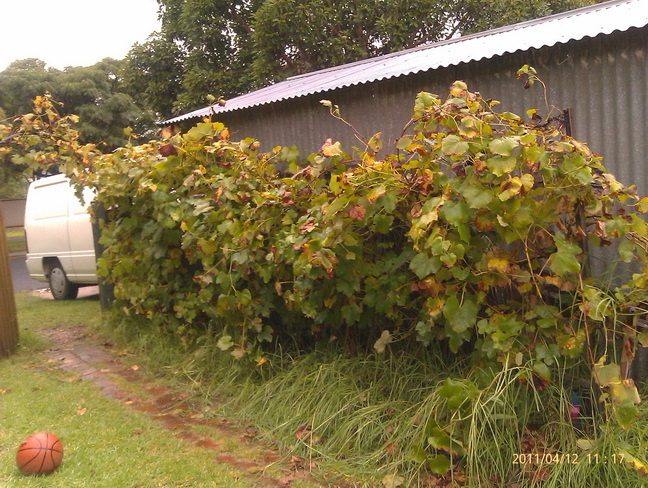 "The Portable Vineyard" is potted grape vines In-My-Back-Yard. Where? 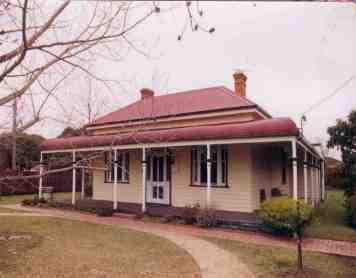 Central Gippsland, Victoria, Australia, called a cold climate area. Why? We were on a budget and because I had never before thought about fermenting grapes. Rather than repeating a website here, I am going to tell it differently instead, referring or using that site until I have the whole thing there- here! Furry boots is it then, and why? When we first bought the house in 1998 there were four old grape vines [the garage vines] of some sort in the garden that were producing funny tasting grapes, maybe just an ornamental as the grapes are not table or wine grapes. Which coincidentally was harvest time in Victoria! The house itself is about 100 years old. The old vines have been referred to as... Foxey grapes... by a wine-making-equipment merchant slash wine-maker. Up until then and since too- I think of them as nearly a table grape and not actually wine grapes. Maybe Traminer? Really- for the 'stil. Autumn 1999, there was a bunch of grapes on the garage vine, so I went to see a home-brew guy down Main Street - Paul was his name- and he suggested I buy a beer brewing kit to make wine from these strange grapes. A hundred bucks later I set off on a brewing and fermenting adventure. Got some grapes and apples and honey and with the beer kit, started it all off, and, there you go, 4 dozen bottles wine and heaps of beer for 1999. The Alcoholery was originally the garden shed (another reason we bought the place, as well as the cellar under the family room and the irrigation system) and is where some of the crafting of wine, beer and spirits is done, bottles and bins and tools stored. For Wine Making At Home I spent some considerable time making an Oak Basket Press during 1999. In late 1999, our Spring, I sourced some year-old Shiraz rootlings from the Riverina in northern Victoria, Australia. I left them for another year in pots, then planted them in the backyard. The first harvest is noted on the old website. 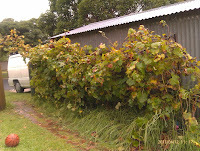 Going through the family photo album and the website, I see that in 2003 I planted some potted cuttings from pruning the established Shiraz vines in 2002- yes- they grew enough! In the places that the vines were though, it was not good enough to encourage good growth, and so were all dug up and potted again. There is not a lot of room around the house in the garden to plant a vineyard as such, so potting the vines seemed a good idea! The local supermarket had large plastic plantpots on special, so I bought a few and transplanted the two- year old cuttings into them. Originally I was going to put some limestone gravel as a bottom layer and soil from the garden and composted material as the rest. But it turned out the gravel was granitic instead, ah well. This is some more on the development that year. One: At pruning time I am endeavoring to propagate cuttings for 3 to 6 potted vines per year. Two: Grow cuttings in a pot, transfer to a bigger pot, them final transfer to the largest move-able pot. A three year journey, and the start of fruiting. Three: As the cutting grows to a meter and a half, careful pruning at the 100cm and 150cm points there about to start training spurs/canes in order to have at least four cordon points, each of up to 50cm long. As I say, it's all purely amateurish, learning as I go, and YouTube is bloody good for that research. I worked for a few years in a vineyard and it's attached winery, and that helps a lot. AD FORD. Simple theme. Powered by Blogger.